My niece Barbara and I left San Jose, California on Thursday June 7th at 7Am arriving in Nashville, Tennessee at 3PM. We gathered our luggage and rented a car and took off for the Archives in Nashville to do some Shirley research. We stayed until closing and then dashed on to Cave City, Kentucky where we checked into the hotel about 9PM. The next morning we were off for a day of adventure. We drove over to Adair Co. Kentucky area in hopes of locating the graves of Thomas and his brother, John Shirley. These brothers were married to the Yates sisters and came from Spotsylvania Co. Virginia. The search was not an easy one. I knew the cemetery was near the town of Mills but we couldn't find Mills on the road Atlas. Eventually we found our way to Mills. The next step was to find the cemetery. After a few attempts we found someone who gave us the directions to this private plot where the Shirleys are buried. To get to this cemetery we had to drive down an old road off of the main one, go across a bridge with no sides, turn up another old road where we could see a deserted house and barn in the distance. We were told the old cemetery plot would be behind the barn. So we took off on foot behind the barn and there were saw an electric fence. The cemetery was on the other side of this fence and there were cows in this pasture where the cemetery sat which was in the middle of the pasture. We looked at each other puzzled how we were going to get to the cemetery. There was no choice but to slide on our stomach under the fence and walk around to the left in the opposite direction as the cows and then dash into the grove of trees where the cemetery was. With that accomplished, we copied the names and dates, took photo's and video taped the headstones and left the same way we got in. We did not find the graves of Thomas and John Shirley. We went back to the main road and to a house we were told some Shirleys lived. We saw the Shirley name on the mailbox. We stopped and they invited us in saying they had just returned that morning from a trip to Florida. We told them we had just been to the cemetery down the road but didn't find the Thomas and John Shirley we were searching for. He told us that old house and barn was where his grandfather and great grandfather had lived. They said they did not know where Thomas of John was buried. They heard there was another cemetery in the area but they had not found it. 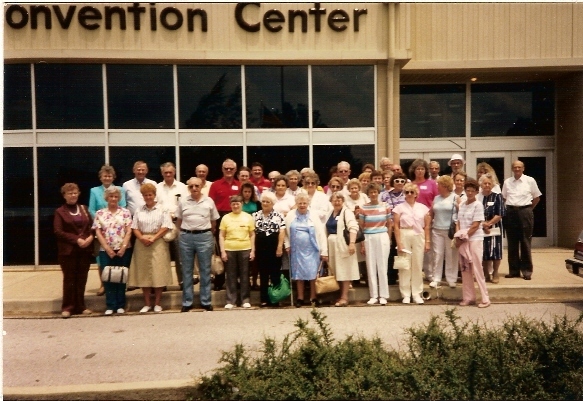 Our time was up and we had to return to Cave City for the Convention and to meet the Friday night early arrivals at the hotel. That is always a fun time just getting acquainted with Shirley descendants and seeing those we have met before. We met Shirley descendants from not only Kentucky but from Tennessee, Indiana, Missouri, Ohio, Alabama, Florida, Colorado, New Mexico and California. Saturday morning we presented the Shirley story and after break we had each person stand and introduce themselves and tell us briefly about their early Shirley ancestor. We always ask them to tell us the branch of Shirleys if they know. Usually if they do not know the branch, I can identify it for them after hearing their story about where their Shirley's were from. After lunch we heard from three speakers including James Young who is very knowledgeable of the Barren Co. KY Shirleys. Following the afternoon break our panel took their seats in front to field questions from the audience on their research. Lower photo is of panel who fielded questions from the audience. 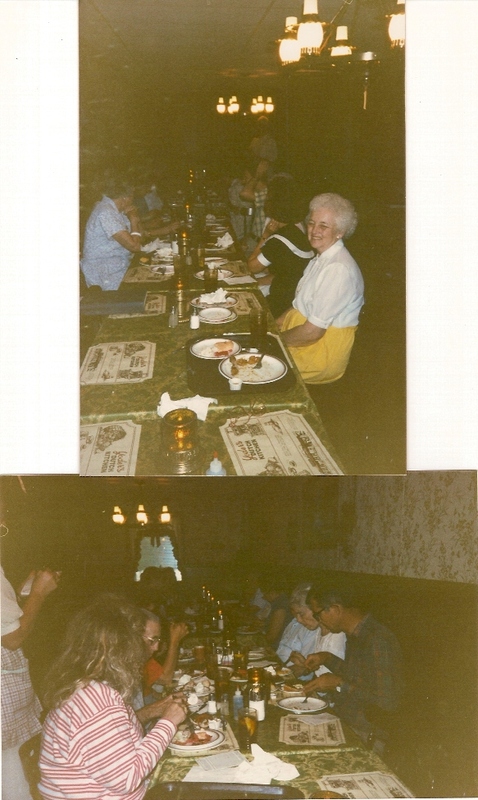 James Young is far left, blue shirt, Elwood Shirley in plaid shirt near TV and Anne Bumpus sitting next to him on the right in green dress, and Marion Shirley next to her on the right. Sunday was a beautiful day for our trip to the home of James and Gwin Young, parents of the Kentucky Headhunters, a country band. We had lunch on the grounds and a tour of their beautiful home. They have so many old photographs of the Shirleys and personal things that had belonged to the Shirley family ancestors along with some fantastic antiques. We visited the old YOUNG and SHIRLEY store and the old Dripping Springs Baptist Church. The church was constituted February 3rd, 1798. Rev. Robert Stockton was the minister at the time. 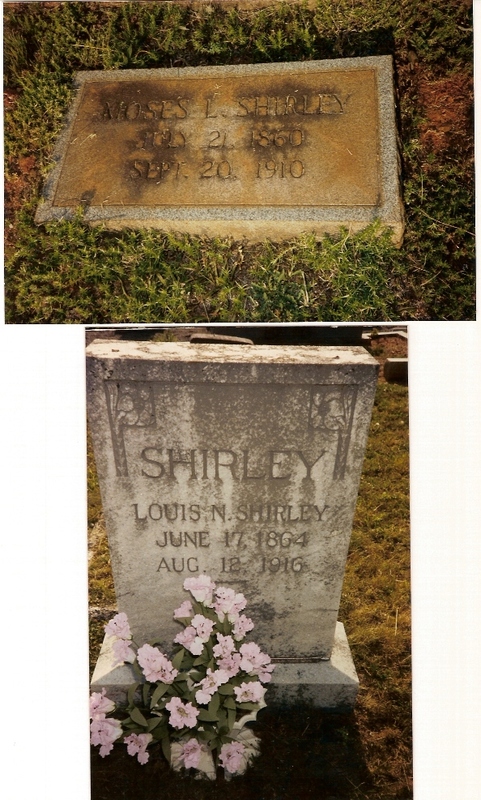 Several Shirleys are in the church records. Everyone went into the church and looked at the original books. James Young felt inspired to go to the piano and played MY OLD KENTUCKY HOME. We found our a place to sit and began singing along. Then there was a request for him to play the OLD RUGGED CROSS. I am sure that song has been sung many times in this old church by the Shirley ancestors. Another request came in for WHEN THE ROLL IS CALLED UP YONDER. I don't know about anyone else but it gave me goose bumps. I could only think of those Shirleys of so long ago and what they would think of us sitting there singing these old songs in THEIR church and our quest to learn more about THEM. After we left the church we went to places like Granny's Spring near where the old Shirley house had stood at one time. 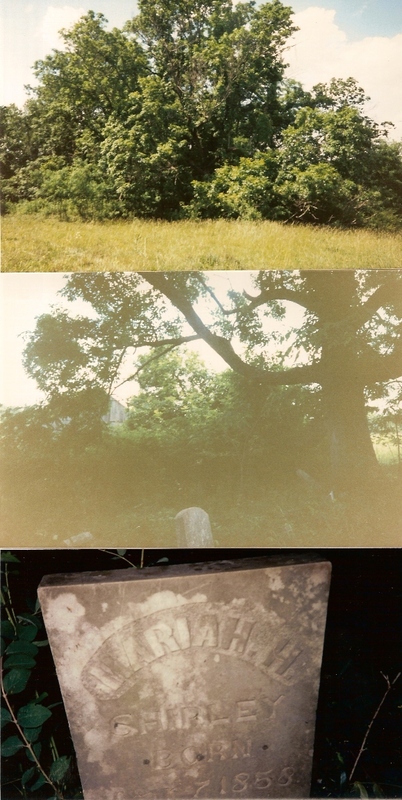 James pointed to the location of the graves of Thomas and Mollie Grubbs Shirley. They are not marked by headstones. We talked about the possibility of contacting the descendants of this branch to raise funds to get a headstone made. 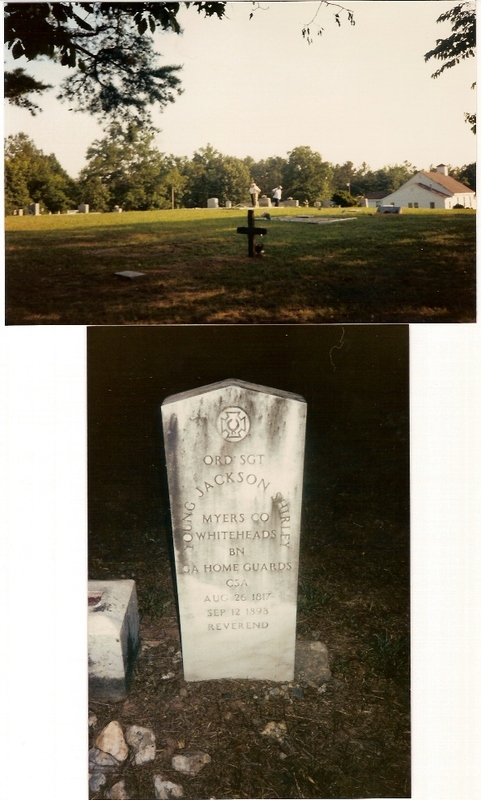 Not many people will know where the graves are after James Young is gone. (NOTE: 2008.... I am pleased to say this was accomplished a couple of years ago). From here we visited the site where James and Mary McMekin are buried. This area was overgrown with weeds about 5 feet high. From here Barbara and I had to say good bye as some were chopping the weeds trying to get to the headstones. I might add that at the close of the Shirley Convention several asked where we were going to have the one next year? I said I had not planned on having one and they were disappointed and urged me to to do one. So, I decided to do it. Convention over, our trip continues! Barbara and I headed for Fort Boonesboro in Madison Co. Kentucky. We drove to the National Park and visite the ruins of the old Fort. Part of the original foundation remains. We began looking for a stone with the names of Michael, Katy and Charles Shirley written on it. We did not find it that evening. We asked the Park Ranger about it and he said it was a mile away at the site of the reconstructed Fort and it wouldn't be open until the next day. I then inquired about old cemeteries and he directed us to one less that a mile away. We drove that direction but did not find it. I suggested we stop at a house we had just passed and ask if they knew about the cemetery and who might be buried init. The lady said it was a real old one and it was just about 50 yards up the road. Barbara and I went found it and I told her there was no way I was going into THAT cemetery. It was almost dark in there and the sun had already gone down. There were weed and overgrowth, the limbs of the trees hung low and it was to much for me. We started walking back to the car and as we looked up we saw three gals walking toward us. They were yelling that they decided to show us California girls some Kentucky hospitality. I yelled back that we might be crazy but I am not THAT CRAZY and there was no way I was going in there tonight. The one gal said she wasn't afraid, she's been in there before and OLD CHARLIE was buried in there and she had found his headstone. She explained this Charlie had fallen off the bridge many years ago. They him up in a hefty size stick and took off with us following them. Barbara and I were nervous and concerned that if we didn't run into snakes or the like we would surely get ticks. Glad to say that didn't happen. We did not find any Shirleys buried in the cemetery but what an experience. It is one we won't forget as these gals were a real crack up and a lot of fun. The one kept calling to out to Charlie saying "where are you Charlie? I know you are in here". She finally found his grave and the funny thing is, his name wasn't Charlie! We worked out way back out to the road, exchanged names and go direction back to a motel where we spent the night. The next day we went to the new Fort and found the stone with the Shirley names. We took pictures and visited briefly inside the Fort. I found some documents preserved in a glass cabinet signed by the Katy Franz Shirley, widow of Michael Shirley, branch #30. I did get copies while I was there. From here we were off for the Court House in Madison Co. KY a few miles away. We found and copied several documents and were on the road again by noon. Our next stop was the Court House in Harrison County Kentucky. It took more time to get to than we had calculated. We copied material here for a short time and were off for Scott County Kentucky Court House which we learned was to close at 4:30PM. After that stop were visited the library and found all sorts of interesting Shirley references. We had copied quite a few things by the time we left at 8PM.We stopped a few blocks away to have some dinner and then back on the road again. We drove to Murfreesboro Tennessee arriving at midnight. We already had reservations. 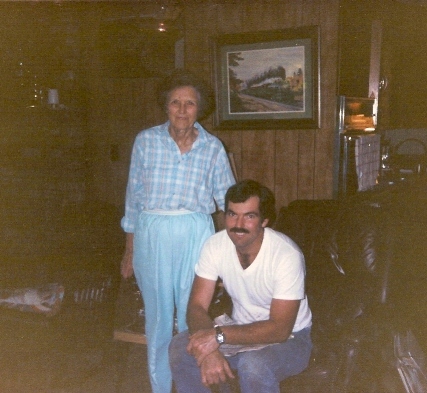 The next morning we called Delman Shirley's room in the motel to let them know we were there and ask if he and his sister were ready to go visiting there ancestor's area in Cannon Co. Tennessee? We had made these arrangements at the Shirley Convention. We ate breakfast with their group in the restaurant and then we were off to the Cannon County Court House. We copied a few things here, picked up some maps, chatted with some of the local people and then headed across the street to the bank to talk to a gentleman who was involved with the local genealogy group. Just as I was about to go into the bank I noticed a $10 bill near the curb in a parking space. What a streak of luck that was! After our visit here with this person in the bank we preceded to the local library for a fast search for Shirley info. I didn't find anything new that I thought I needed and since time was passing pretty fast we decided to get on the road again. We said our good byes to Delman, Alice and their group and dashed for Woodbury to meet Jemima Shirley. Jemima was waiting for us at the Court House as per our plan. We copied things and then were off for White County (TN) to see what we could find there. We copied a few more things and then headed back to Woodbury to take Jemima to her car. We headed for Ringgold GA making a stop to visit Paul Shirley in Whitwell, Marion Co. TN. We arrived at Jemima's in Ringgold George about midnight. We stayed with Jemima at her house. She fixes us a snack as we had not had dinner. It was 1:30AM before we headed to bed. To say we were tired is an understatement! The next morning we were up at 7:30AM. Jemima showed me the research she has collected for years. Fortunately she had a copy machine and I copied anything I thought I could use. Jemima fixed breakfast and I took a break to eat, then it was back to the copy machine as Jemima and Barbara cleaned up the kitchen. I read as fast as I could through various books and notes. It took a couple hours to do this. We left mid morning to head for our next stop. The next stop was a surprise visit to Zora Jarret in Calhoun Georgia. She is a descendant of the Habersham Co. Georgia Shirleys. (Branch #38). She was very surprised. She showed us pictures and family information. She allowed us to take her material to a copy machine into town to find a copy machine. We brought her things back to her in about 45 minutes and we were off for Cornelia, Georgia. 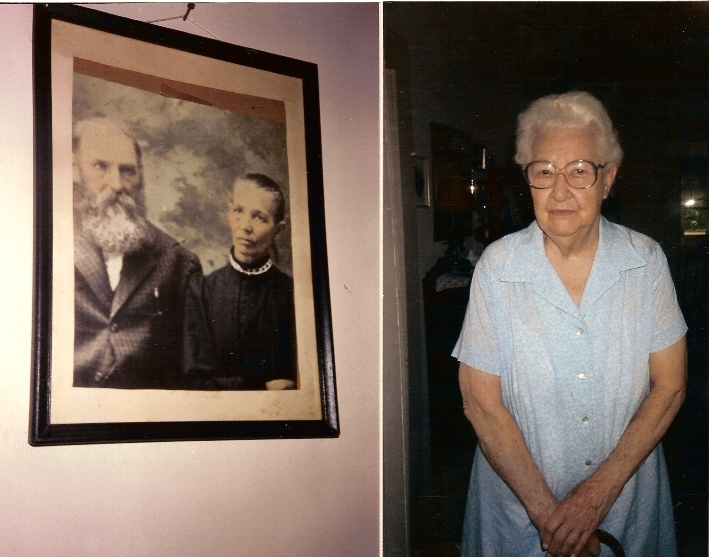 We arrived in Cornelia GA about 3:30PM and met up with Fletcher and his wife, Vesta Shirley. They helped us find a motel and helped us carry our luggage into our room. Fletcher made a call to Conny Shirley who was waiting to get is call saying we had arrived. We all loaded in Fletcher's car for a visit Rabun County, picked up Conny and visited a couple of cemeteries. When we returned to Conny's house, we were invited for dinner. After dinner we drove back to Cornelia and visited more cemeteries and places the Shirley family had lived. It was dark when we arrived at Fletcher's house. Vesta got her research out to show me and had been so kind as to have it copied for me before we arrived so I had copies to bring home with me. We left their house about midnight to go to our motel. It was 1AM before we turned the lights out. The next morning we spent at the Habersham County Court House where we copied additional items on other Shirleys. From here we headed for Honea Path, South Carolina. We arrived at Dot and Julian Ricketts for a short visit and headed to Due West to visit Lydie Thomas (a Shirley). That evening we met with several Shirley descendants at Yoder's Restaurant. It was great to see John and Caroline Scott, Jim and Fran Pinson, Alex and Jean Conselyea, Lillian Shirley, Mary McKeel, and several others who came to the meeting. We were disappointed Jim Austin wasn't there. We learned he had been to the doctor that very afternoon and the doctor was considering placing him in the hospital the next day. It appeared he might have a blood clot. 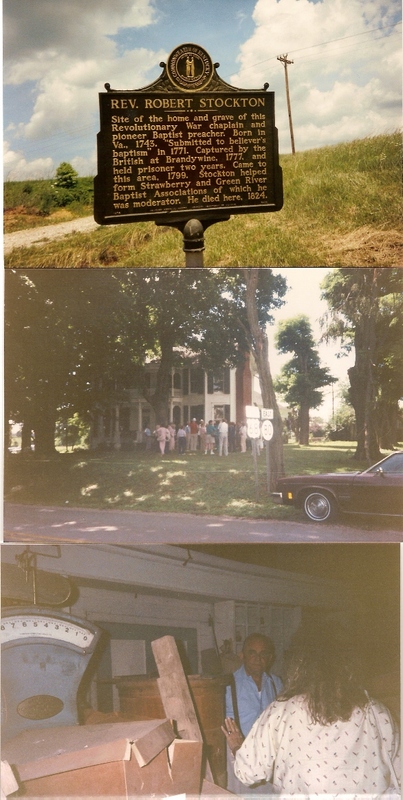 (Jim is the one who donated the old Obediah Shirley house in Honea Path). 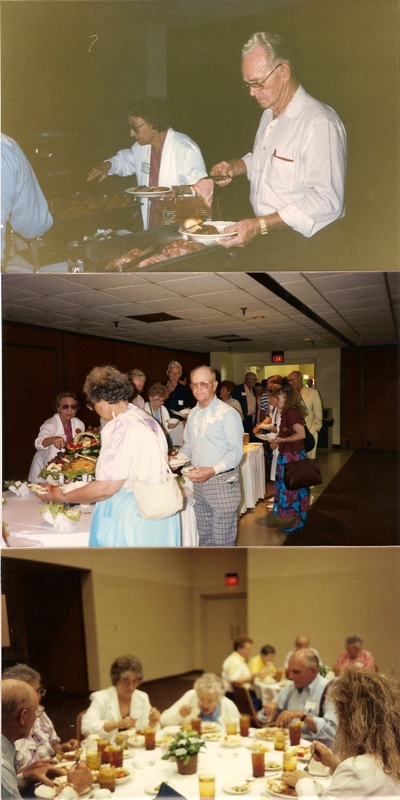 We spent the night with Lydie Thomas and after breakfast the next morning we were off for the Court House in Laurens Co. SC. We spent the morning here looking up things and copying various Shirley items. About the time we were ready to leave, the librarian approached me and asked if I was Betty Shirley. She said I had a phone call. The gentleman on the other end apologized for not making the Shirley gathering the night before at Yoder's. He explained they had just returned from a trip and couldn't make it. He invited us to stop by their house which was very near the library. We did and then we were off for the Spartanburg County Court House and the library to continue our Shirley research. By 7PM we were back in Honea Path. Dot Ricketts had dinner waiting for us when we got there. We then went over to Jim Pinson's house which was prearranged for that evening. He took us over to the Obediah House and from there Barbara and I stopped at Jim Austin's house to see if they had put him in the hospital. I was delighted he was there and up walking around. (Jim Austin went to England with us last year). We had a nice visit with him before heading back to Dot and Julian Rickett's (1/2 mile away) where we spent the night. We sat up until 1AM visiting with them as we had not had a chance to spend any time with them other than to eat dinner. The next morning Barbara and I were up early to repack our luggage and put it out in the car. We ate breakfast and and spent a little more time with Dot and Julian. By 11AM we were off to the library in Anderson, SC. We lost track of time as we researched and suddenly realized we were an hour past when we should have left for the airport in Atlanta. We drove more than 70 miles per hour at times to make up for the hour we were behind. We ran thru the airport and barely made it as everyone was already seated on the plane and they had made their last call for passengers. We arrived at 8:30PM in San Jose California. We were exhausted and so happy we made it! A very close call it was! At home the next morning, I began to organize the research we had collected on this trip about 6 inches tall plus Barbara and I each had a notebook we made notes for what we found and did not copy. I think we had a successful trip! I am pleased we have more knowledge than every before on the SHIRLEYS. We collected so many deeds and other documents for our files. Another item I am happy to have are the Church Minutes for Dripping Springs church as well as minutes from other churches the Shirleys attended in the early days. THIS WAS A VERY PRODUCTIVE TRIP!